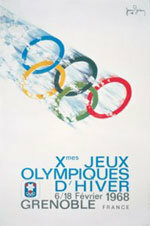 Grenoble was host to the first Winter Games in France since Chamonix in 1924. Only the skating took place in Grenoble, while the skiing events were held in the mountains. The Olympic teams were therefore spread over a wide area. The great champion was Jean-Claude Killy who won all three alpine events. With 6 golds, 6 silvers and 2 bronzes, Norway was best nation. The cross-country girls’ performances, with the relay gold and two individual medals, marked a long-awaited breakthrough for Norwegian women’s Nordic skiing in the Games.